A clear and simple picture of how to follow Jesus as our disciple-making model. Includes videos and a leader’s discussion guide. 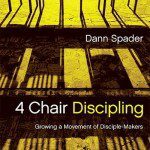 A companion resource to Sonlife's 4 Chair Discipling Seminar and Dann Spader's book, 4 Chair Discipling. A half-day seminar about the stages of growth Jesus addressed in the people He met. For disciples, ministry teams, and leaders. A week-long intensive evangelism and apologetics training for students. Get awesome disciple-making content and notifications about new training and resources in your inbox once a month.